ZAMBOANGA CITY, Philippines (Mindanao Examiner / Mar. 8, 2011) – The Philippines’ largest rural bank, One Network Bank, has announced Tuesday the opening of its third branch in Zamboanga City in Mindanao, and is planning to put up another branch soon. Alex Buenaventura, president of the One Network Bank, cited the stable peace and order in Zamboanga City and the growing banking demands for their expansion project. Zamboanga City serves as the trading center of the provinces of Basilan, Sulu and Tawi-Tawi - all part of the Muslim autonomous region. “There is a growing demand in Zamboanga City for One Network Bank and that is why we are opening another branch in this beautiful city. The peace and order is very good and that’s why we are here,” Buenaventura said at a news conference. At present, One Network Bank has 81 branches in Mindanao and is planning to open more in rural areas and a future expansion in the Visayas and Luzon. “We will be the largest producer of commercial banking services in the country,” he said. The Davao City-based One Network Bank boasts of over P10 billion in assets with more than half a million depositors in the southern region. It has over P8 billions in deposits, according to Buenaventura. “We are number one in rural banking in the country. Our capital has increased continuously every year and this is because of our commitment to serve the public as our slogan “Pera sa Mindanao, Para sa Mindanao,” Buenaventura said, adding their vision and mission is to accelerate countryside development through the bank’s expansion in the countryside and providing responsive financial services. Buenaventura said their bank also has helped many banana plantation owners in Mindanao by providing them competitive loans to finance their operations, and is also planning to provide similar programs to rubber plantation owners in Zamboanga Peninsula. 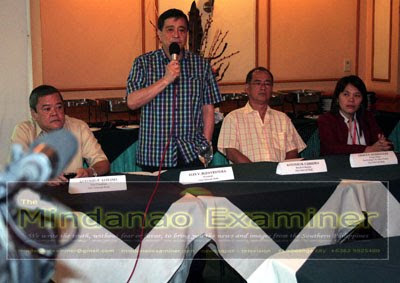 Buenaventura was accompanied in Zamboanga City by top executives and among them were Antonio Avelino, the bank’s vice chairman; Antonio Cabreira, board member; and Grace Dominguez, cluster head of Zamboanga City’s One Network Bank.